Engagement rings can be created in many different shapes and styles, and made from a choice of precious metals, with plenty of room for colour through a range of different stones. 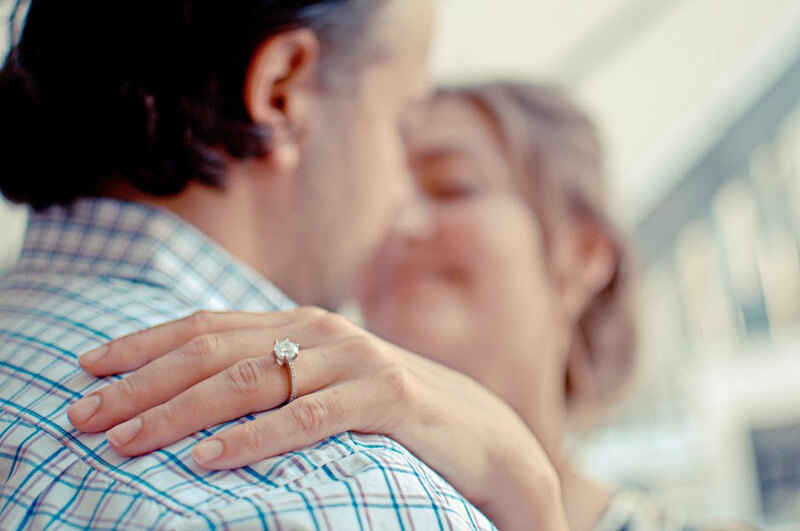 Despite the many different styles that could be created, time and time again, brides-to-be, and their partners, opt for the solitaire diamond engagement ring as the style of choice. But, what is it about the solitaire diamond ring that is so very special for so many couples? The simplicity and symmetry of a solitaire diamond ring is very appealing to brides, because not only is a solitaire ring easy to accessorise, it is understated yet the design so perfectly frames and highlights the precious stone. The symmetry in a solitaire ring is created by the claw settings that are a part of the classic design made popular by Tiffany & Co, who helped to make the solitaire ring the most iconic design in the jewellery industry with their 4-claw design. It’s also possible to choose 6-claw or bezel settings depending on the cut of diamond and overall look of the ring that you’d like to achieve. A solitaire ring also fits well with any wedding band design, whether plain or intricate. For partners looking to pick out the perfect engagement ring for their bride-to-be, the solitaire diamond ring with a round brilliant cut in a claw setting is a great choice as there is no reason to dislike the style; it suits all tastes. With a good quality, expertly cut diamond, any recipient of a diamond solitaire engagement ring will instantly fall in love with their new piece of jewellery. Choosing white gold or platinum with the diamond creates a simple, but sparkling colour palette that will match with any other jewellery or clothing style. Yellow gold contrasts with the diamond to make it pop, and rose gold is perfect for anyone who loves the vintage style, which has been very on trend over the past couple of years. Solitaire rings are commonplace in marketing campaigns associated with weddings and have been since the early 20th century, when a popular diamond trader worked with an advertising agency whom coined the phrase “A diamond is forever” and used glamourous images of celebrities showing off their jewels. Later down the line of course, a variation of this phrase “Diamonds are Forever” was used as the title for a James Bond film and huge theme tune from Shirley Bassey, ingraining the sentiment in the minds of ladies across the land. Thanks to clever marketing, popular culture and fashion women began to long for diamond jewellery as it was a statement of commitment and class. Diamonds are regarded as the most precious and pure gemstones by most, and will always continue to be the go-to gift for any gentleman looking to delight and indulge his bride-to-be. While the classic single brilliant round cut diamond is still the most popular style, variations on the design including the addition of a diamond set band are becoming increasingly popular as many brides feel that the more diamonds on their ring, the better! The extra sparkle of a diamond set band can be breath-taking. Different options include a half-set, three-quarter-set or a full diamond band for maximum sparkle. Diamond set bands can be created in different settings too, such as channel settings or pave. Using a mixture of these styles, you can create your own unique take on the diamond solitaire engagement ring. Our designers at Diamond Boutique can help you to create your own design, as we have years of experience in creating bespoke engagement rings and know which elements work well together – so get in touch with us to discuss your needs.